The dawn of the drone shipping era has come a step closer. 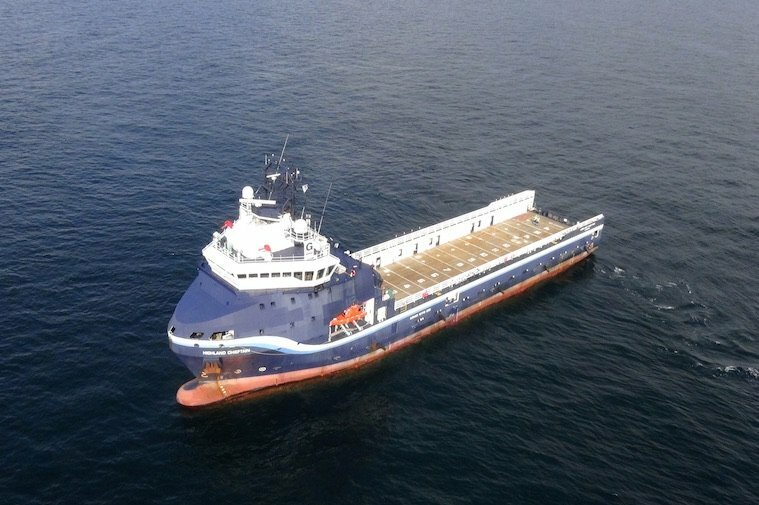 Finnish technology group Wärtsilä has revealed details of a landmark test run whereby a PSV was controlled remotely 8,000 km away. The testing, which involved driving the vessel through a sequence of manoeuvres using a combination of Dynamic Positioning (DP) and manual joystick control, was carried out on August 21 off the North Sea coast of Scotland in collaboration with Gulfmark Offshore, an American OSV operator. The remote control navigating was carried out from the Wärtsilä office located in San Diego, California. The vessel, the Highland Chieftain is an 80 m platform supply vessel already fitted with a Wärtsilä Nacos Platinum package for Navigation, Automation and Dynamic Positioning systems, as well as a Wärtsilä drives package. For the test, additional software was temporarily added to the DP system in order to route data over the vessel’s satellite link to the onshore work station in California. The Wärtsilä testing was carried out using standard bandwidth onboard satellite communication. No land-based technology was used for the communications between the vessel and the remote operator work station. The retrofitting of the DP software was completed within just 30 hours. The successful test was conducted over an almost four hour period during which time the vessel was driven through a series of manoeuvres at both high and low speeds. All the test procedures carried out went as planned, Wärtsilä reported today. More pilot projects are envisaged soon by Wärtsilä including one looking at automated docking procedures. How many people were on board monitoring this four hour test? The basic technology is not exactly new. Sealaunch Commander remotely controlled the Sealaunch Odyssey for satellite launch back in 1997. Both line of sight and ethernet via communication satellite were part of the communication and control system. In this sense, old technique, newer parts. What becomes the pressing concern with remote access to vessel control on the verge of affordability is security of the communications medium. How safe are your hubs ? Iran and Ukraine learned that lesson the hard way. Russell I was just making the same comment about SeaLaunch, as I was myself an officer onboard the Commander. The Offshore Support Vessels have had a high level of automation for the last two decades and it is fairly easy to have them automated and remotely controlled. The challenge is more the regulations and data governance.